SILVER LINING takes place in the upper day room of the Silver Retirement Home in Gravesend. Storm Vera is battering the country and freak floods has prompted the evacuation of all riverside properties. But as five elderly ladies wait patiently in the retirement home for help to arrive, it soon becomes clear that they have been forgotten about. Only a young woman from Croydon – an agency nurse looking to make some cash – has been sent to help them, but she has no idea what to do. With the storm floods rising and no rescue team in sight, the ladies realise the only way they are going to survive is to save themselves and recreate THE GREAT ESCAPE – senior citizen style! At a time when social care for the elderly is in crisis in the UK, Sandi Toksvig’s new play takes us right into the heart of a care home. 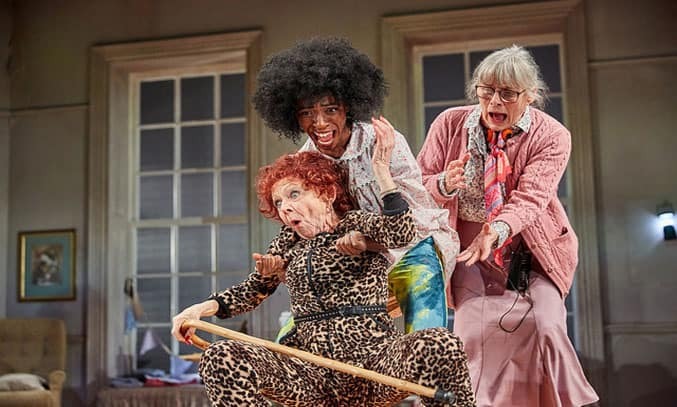 Toksvig reportedly wrote the new play out of concern over the dearth of acting roles for older-women actresses but despite the best of intentions, the piece just paints a disappointingly stereotypical picture of the elderly. The play sees five senior women take centre stage. Each woman has her own story – one is suicidal, one is hopeful that her daughter is coming to get her soon, one speaks about her life as a lesbian at a time when society deemed being gay wrong – yet these stories are clunkily woven into the fabric of the play. Instead of focusing on the characters, the piece instead chooses to go for out-and-out comedy. Far too much time is spent setting up the situation and delivering the one-liners instead of fleshing out the characters and their stories. As such, the pacing drags, the comedy feels mechanical and the play lacks any real warmth. In terms of cast, the distinguished veteran performers do their best to make the most of the material and for the most part, deliver an engaging performance. Maggie McCarthy and Joanna Monro as May and June make a splendid double act as the pair of bickering sisters, while Amanda Walker puts in an entertaining performance as St Michael. But it’s actually Shelia Reid as the leopard-print wearing 86 year old ex-barmaid Gloria who holds the show together, becoming the cheerleader for the sisters-do-it-for-themselves style fightback. That said, there are also some funny moments in SILVER LINING and underneath all the comedy, there is an important message about our responsibility towards the elderly and helping to bridge the gap between generations. SILVER LINING runs at The Lowry until 8 April 2017.